A post modern New Orleans brass band from Philadelphia, stompin', swingin' and jazzin' it up! 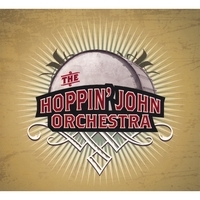 Established in 1996, Hoppin' John Orchestra has seen our our music and our musicians evolve and change in many ways over the years. For the uninitiated, Hoppin' John is a tasty, tasty dish, one of whose main ingredients is black-eyed peas. One look at a current radio chart and one can see why the change occurred. Still and all, we find it a fitting moniker for our efforts. Four of the original eight members remain: Matt Cappy on Trumpet, Tony Gairo on Flute, Clarinet, Soprano, Alto and Tenor Saxophones, Mike Hood on Bass, Trombone, Arranging and Composing and Lou Fuiano on Alto, Tenor and Baritone Saxophones. As the creative director and main arranger/composer, there are a few things I try to keep in mind when selecting repertoire and composing new materiel for the group. An over all 'sound' which includes that delicious organic wind instrument timbre is certainly our aural calling card. Also, more complex and sophisticated Jazz harmonies tend to predominate. Each wind player brings a unique and special musical personality to the gumbo of sound. With this in mind, I do try to emulate one of my idols and perhaps the 'Zeus' in the pantheon of American Musical Geniuses, Duke Ellington. Among his many, many brilliant innovations, writing for the individual players in his bands was a hallmark. I try to do the same. Certainly the musicians can play anything put in front of them but there are particular musical identities which have emerged over the years and I try to keep these in mind and positively exploit them whenever possible. The fluid nature of the rhythm section's interaction in general is one of the great strengths and joys of this ensemble. There is much Jazz sensibility in our group as nearly all of us come from that school of thought and sound. There are plenty of opportunities for improvisation as well as through composed areas and pieces. what an awesome CD you guys made. can't get enough of it. listen to it all the time. love the beat. saw you at the flower show, what a great performance you put on. we love you tony and louis.